Support slot for WEIRD AL YANKOVIC wanted! Support slot for WEIRD AL YANKOVIC wanted! OPEN UP FOR WEIRD AL…! Wanna be the opening act for Weird Al Yankovic on 8th March? 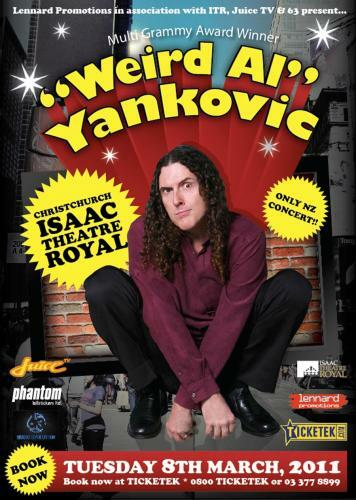 CHART are giving you the opportunity to be support act and open up for Weird Al Yankovic at the Isaac Theatre Royal on March 8th at his only NZ concert, here in Christchurch..! WEIRD AL YANKOVIC, the undisputed king of pop culture parody, has sold more comedy recordings than any other artist in history. In a career spanning three decades, he has amassed 28 Gold and Platinum albums, 7 Gold and Platinum-certified home videos and 3 Grammy Awards (with 12 nominations). Weird Al is idolised worldwide for his parodies of many of the biggest songs and most important artists of the last three decades including Michael Jackson, U2, Madonna, Nirvana, Eminem, Puff Daddy, Usher, Sting, and loads more. His only NZ concert in Christchurch will feature all the characters, all the costumes, bubble machines, glitter guns, in a 2 & a bit hour audio visual live extravaganza. – email to info@christchurchmusic.org.nz with your band/act name and ONE contact name + email & mobile details + a web link to whatever music website you have (Facebook, Rootmusic, Myspace, whatever…) that contains stuff to listen to, look at and general info. PLEASE DO NOT EMAIL MUSIC OR VIDEO FILES OR LARGE PHOTOS AS ATTACHMENTS, they will be deleted. – applications close on TUESDAY 23rd FEBRUARY at 5pm. Winners will be contacted directly on Friday 25th February. – winners will be promoted via CHART website www.christchurchmusic.org.nz leading up to the concert. – Weird Al’s concert is all ages, so if your music contains sexually explicit or violent lyrics, or contain any profanities of any kind which would usually attract an R18 tag, please do not apply. – you get 20 minutes performance time on stage and 15 minutes to set up and soundcheck prior to show. – you must be Christchurch based or be of Christchurch origin. – you must get yourself to and from the venue. – you will get paid $250 + GST and will get 8 complimentary tickets to the show, guests are not permitted backstage please. – once you have completed your performance you will need to pack out immediately and vacate backstage. WEIRD AL YANKOVIC – LIVE IN CONCERT – ONLY NEW ZEALAND DATE…!!! Posted on February 8, 2011 June 28, 2017 Categories RamblingTags Isaac Theatre Royal, Weird Al YankovicLeave a comment on Support slot for WEIRD AL YANKOVIC wanted!